What is prosperity? How do we know when we are truly prospering? First, to prosper is to be blessed by God; yet, even the unrighteous are given a level of blessing since they were also created by Him. Second, is to be living in alignment with God’s Word; yet, not everyone obeying God’s laws prosper. Finally, we know we are prospering when we are in tune with God’s will and Word; yet, many Godly men have become ‘out of sync’ with Him. So, what is the reason for this elusive prosperity? Specifically for those following God? The answer, short and simple, is love. The love of God, for God, His Word, His laws, His ways, His will, His Spirit, and His Son. Yet, within this we have to be willing to listen and pay attention to the signs of the times; listening to the ebb and flow of God’s Spirit within us. Born October 16, 1889, in Eastern Germany to Jewish parents, Franz Anton Ledermann had not only a good start but also a good life. He was able to attend Breslau University and attain a law degree, and even went on to Geneva University in Switzerland, graduating with a doctorate of jurisprudence. He was a highly intelligent man, and successful in his practice. At the age of 35 he married a Dutch-Jewish woman, Ilse Luise Citroen, and within a few years, they had two beautiful daughters, Barbara and Susanne. To look at his life it was obvious he was prospering. After all, his law practice was flourishing, he had a large house with servants, and had a happy life with his wife and children… but after the Nazi’s came to power in 1933 much would change. 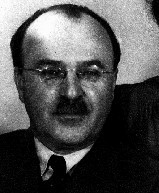 The Nazi party forbade Jewish lawyers to have non-Jewish clients, and so, despite earlier failed attempts by his wife’s family, Ledermann finally agreed to move his family to Amsterdam. There Franz was forced to go to school for three years to gain a Dutch degree in law so he could once again practice, this time working alongside a Dutch lawyer whose main clientele consisted of Jewish refugees. Still, Franz’s practice did well and his family was comfortable in a southside apartment… until Germany invaded the Netherlands in May of 1940. For a few months, the German occupation of the Netherlands didn’t overly affect Franz’s practice, but it wasn’t to last. In 1941 Franz began to do legal translations for Amsterdam’s Jewish council, an occupation that would delay his deportation. Still, despite the mistreatment of Jews within the Netherlands and the mistreatment he’d known in Germany, Franz wasn’t willing to believe the worst—even going so far as to refuse false ID’s that would allow his family to go into hiding. He didn’t want to believe that Jews were in danger despite the deportations, nor did he want to believe that cooperation with the Germans wouldn’t be enough to protect him or his family. He was still sure he was prospering. Yet, on June 20, 1943, he and his family would learn that cooperation wasn’t enough. The Ledermanns and their younger daughter, Susanne, were deported to Westerbork, a camp in the Netherlands where they would spend many months, before being moved to the dreaded Auschwitz in 1944. Franz Anton Ledermann died in Auschwitz at age 54, finally knowing the truth of the Nazi party’s plans—his wife, age 40, and youngest daughter, age 15, also died there. His eldest daughter managed to survive the Holocaust by hiding in Amsterdam under one of the false ID’s her father had refused. Why did Franz Anton Ledermann not believe there was reason to believe the worst? Franz sadly was like many Jews during the Holocaust—blindly believing that they would somehow prosper in lands filled with hate for them. In a way, it isn’t too surprising. Throughout history Jews have been mistreated, had special restrictions place upon them, been deported to new lands, etc. For many Jews, it was considered a way of life, and to prosper was to continue on no matter what happened. The Torah recounting much Jewish suffering was studied, but this was the 20th century, mass murder surely wasn’t going to occur, and slavery had been outlawed. So what were a few restrictions or even potential deportation to new lands? Nothing, right? Franz Anton Ledermann wasn’t stupid, he was an educated man, like most of his Jewish counterparts. Yet, generations of persecution had led the Jewish people to become complacent—not recognizing the signs of the times. So many victims of the Holocaust didn’t want to leave the places they loved, the friends and family they cherished, just because things were a little rougher than they’d been in years prior. Besides, anti-Semitism wasn’t uncommon, as they had found a level of it almost anywhere they went. They had lowered their standards of prosperity, no longer realizing that God loved them and didn’t desire them to lower their standards. They didn’t know how to tell what true prosperity looked like anymore. Today, most of us are in a level of standard above what those who faced the Holocaust knew, yet it’s still vital to understand what God’s standard of prosperity is for us! HE is the one who truly knows what prosperity is and what each of us requires for our call. We must learn to listen to Him so we’re not taken in by a false prosperity. In this hour there are still many Holocaust survivors left, but the number is dwindling. Of these survivors, shockingly high percentages are presently living at or below the poverty line! After surviving that horror, few of us ever realize they are struggling to meet their basic needs. In the Bible, it says of Israel and the Jews, “I will bless those who bless you…” (Genesis 12:3). The time left to bless the survivors of the Holocaust is short. Yet, YOU can help! By planting an olive tree via My Olive Tree in honor of a Holocaust victim YOU can give a warm blanket to a Holocaust survivor who otherwise would have to go without. Additionally, you’re honoring the memory of a Holocaust victim AND giving jobs and beauty to the people and land of Israel for years to come. Let us bless Israel and her people. Let us give joy to them and ourselves, along with the prosperity God desires for all of His children!